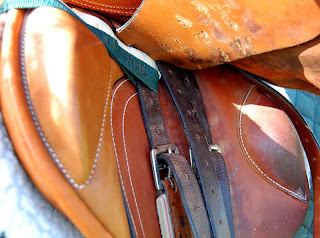 Three years ago while I was at the Quarter Horse Congress, I fell in love with a saddle. I wasn't really looking for a saddle. I already had two western pleasure saddles and one close contact English saddle. So, really I did not need another one. But as my friend and I browsed through some stores, I came upon it. This funny colored saddle. The skirt looked weird and was super soft. The saddle just caught my eye. Then I did the one thing that I shouldn't have done. I sat in it. Oh my softness. The saddle just fit me like a glove. It felt like it was made just for me. It wasn't stiff or creaky how some new saddles are. The saddle just conformed to me. I was in love. At the time, I was getting into eventing. I had a 16 hand Thoroughbred that I had been jumping and I wanted to try some eventing. The close contact saddle that I had been riding in didn't have any knee roll. It was almost like riding in a jockey saddle. This new saddle had a knee and thigh roll. Just perfect for keeping my leg where it's supposed to be. Can you see the knee roll and the thigh roll? Love them! I called Mr. Cowboy and begged. I had to do a lot of begging. Pleading really. This saddle was not a cheap one. 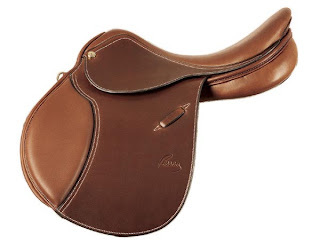 I had always sworn that when I bought a new English saddle that I was going to buy a Pessoa. I have drooled over the Pessoa saddles for a long time. But when I sat in the Pessoa, it was nothing like the other saddle. Just not as comfortable. I was kind of sad, because I really wanted a Pessoa. But my rear was telling me different. So, I sat in the other saddle just one more time. And I was sold. I finally convinced Mr. Cowboy that he was sold too. And I left the Quarter Horse Congress with a new Joseph Sterling CC Buffalo Saddle. It rides like a dream. And when I take the saddle out of its bag, I just smell it. Oh the sweet smell of new leather. I just love that smell. Oh for the love of leather! And the saddle doesn't look half bad on Ozzie either. This is the saddle that I have been riding Ozzie in. I feel quite at home in it. The reason why I feel so at home in it.......well..........I have a confession to make. I grew up riding hunter/jumpers. 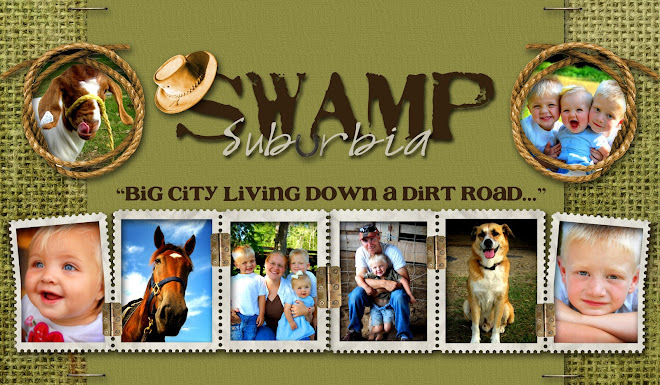 I practically lived in an English saddle. So, when I went to college, I was signed up for the English barn. But then I met some cowboys and they convinced me to switch my major over to the western farm. Cowboys................ sigh, it was their southern accent, cowboy hat, and jeans that did most of the talking. 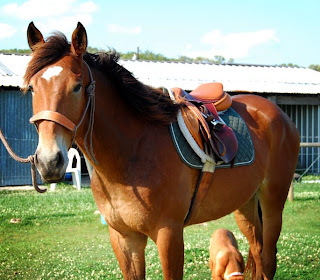 So, for the first time in my life ever, at the age of 18, I rode in a western saddle, at college. Let me tell you, that the first day we all rode, I got bucked off. Yeah, it wasn't pretty. You know it's bad when you hear some one yell, "Get OFF!!" The horse did it to everyone who was assigned him after me, so I didn't feel so bad. But still it was the first day of riding western. Not really a good introduction to the western world. Nonetheless, I am glad I made the switch. I learned so much at the western farm. I never have regretted my decision. 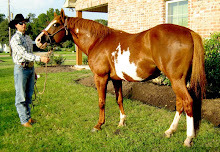 The last horse I sold was a hunter and dressage horse. And everyone loved how collected and soft he was. I thank my western instructors for that. So, that is why I feel so much more comfortable in my little English saddle. Hello my name is Andrea and I love to ride English! 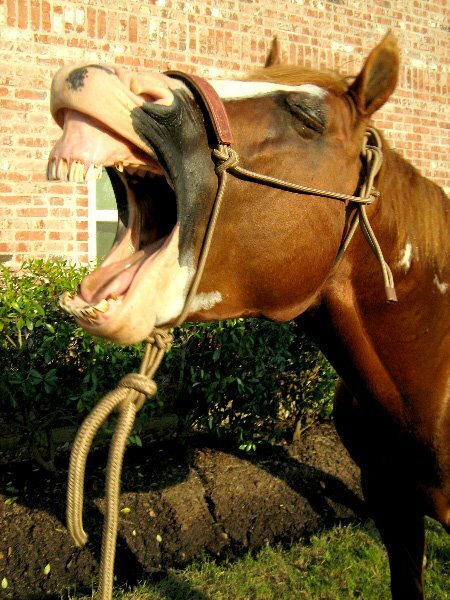 Some one had asked how I could ride a horse that I knew was going to act up in a saddle without a horn. Well, I have noticed in the past, since I have never ridden with a saddle horn, I never used it. Even when a horse goes to buck. It's just not instinct to grab it. So, not having a horn to hold on to, for me, is not a big deal. But I love my Joseph Sterling saddle. I would not trade it for anything. And so far, Ozzie and I are doing great in it. We have speed control and some understanding. We are still in the round pen, but I hope to venture out soon. Ozzie is more than ready, I just need a bit more time. So I am not the only one with LSD, leather sniffing disorder. I got a new saddle 2 yrs ago for Christmas from my daughter. A Tex Tan beauty. It is in my living room on the saddle rack. I have never ever even sat in an English saddle. Probably never will since I am 51 now! I love sniffing the leather too! I love it--"My name is Andrea and I love to ride English." I'd have never guessed you rode hunter/jumpers the way you always talk about falling and such. I'm impressed! You'll have to show us some pictures of you riding a hunter jumper and eventing. How cool! You know, I think I'm like you. I just don't think of holding on to the horn ever....which I wish I would have done when I fell of my mare on Christmas Eve. Maybe I would have been able to stay on? But I don't think my seat is balanced and strong enough to ride English, though, either. I can say I have never ridden in a English saddle. For me though, it wouldn't be good! Need the horn to rope! He he he! that is a nice looking saddle though! Looks pretty great on Ozzie as well! you dont have to explain yourself to me... i do everything in a dressage saddle. Joseph Sterling CC Buffalo Saddle huh? 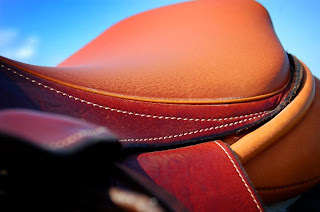 Ya know when I was hunting for an english saddle last summer I was hearing some really great things about those....never got to try one but I have a pair of english reins by Joseph Sterling and they are quiet nice - the softness and "feel" of the leather is unlike anything I have come across. I remember thinking when I pulled them out of the box that I should have waited and tried one of their saddles. Not that I am not happy with mine - I love my Beval! But still would've been nice to at least sit in one before I bought the Beval. From the sounds of everyone else you'll be super happy with that saddle until you wear it the heck out! Congrats!